See all the pins your in location at once. 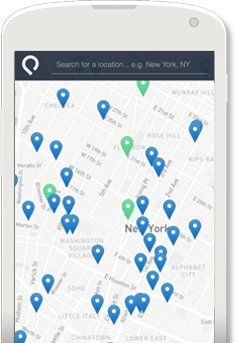 You can view listings with the app itself, but this map gives you a birdseye view. We use different style pins to show off different types of locations. Green pins are pool halls, blue pins are bar tables with photos, grey pins are bar tables without photos. Use the search bar to browse different parts of the world. You can share the map in certain areas with friends. Search for "Kentucky", copy the address bar, and send it to your friends in Kentucky.